Fourth graders at Sunset Elementary paint ornaments for the Capitol Christmas Tree during art class. The tree comes from Meeker this year, with the theme, "Celebrating the Great Outdoors." 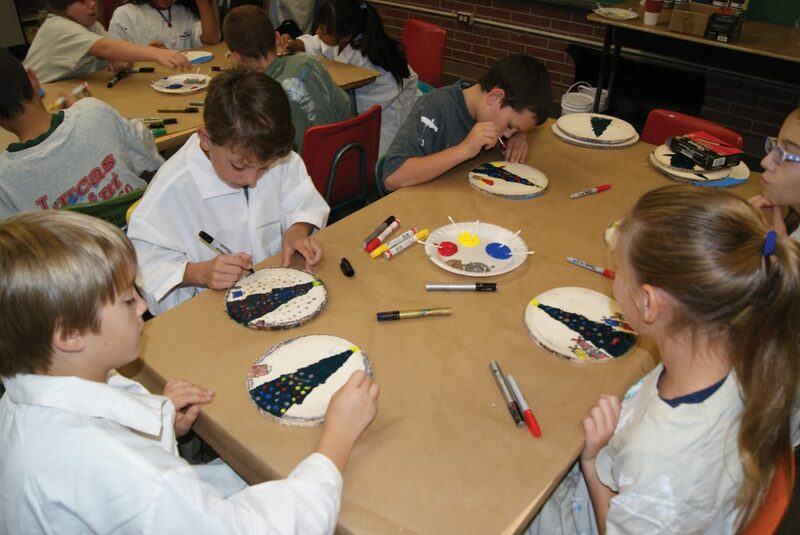 Although it’s only the beginning of October, Steve Martinson’s elementary art students are busy painting Christmas trees on ornaments they’re making. Elementary and middle school students are making ornaments to adorn the 2012 Capitol Christmas Tree, which is coming this year from the White River National Forest near Meeker. “It’s quite an honor,” said Martinson, art teacher for Ridgeview, East and Sunset Elementary School. Students made ornaments that were recyclable by painting slices — tree cookies — of dead or standing aspen trees. The slices, over 1,200 of them, were cut and donated by Ray Durham of Hamilton. Groups all across the state are contributing ornaments but with over 1,000, Craig students are contributing almost one fifth of the total ornaments for the tree. The tree will be cut Nov. 3, then will make its way on a tour of Colorado throughout the month, making a whistle stop in Craig the afternoon Nov. 6 at the Walmart parking lot. Fourth graders at Sunset painted snowmen, snowmobiles, skiers and snowboarders, deer, and elk, among other things, onto the landscape side of their ornaments. Some students even attempted painting gondola cars. Mary Cunningham, the U.S. Capitol Christmas Tree Ornament coordinator, said she has been traveling around since last January, spreading the word about the project. Partnering with the non-profit group Choose Outdoors, Cunningham said the program is built around a big focus on the students, and the theme encourages awareness of public lands and the different activities people can use them for. “We tie it in by asking kids what they like to do outdoors,” Cunningham said. Martinson said the ornaments wouldn’t be returned to the school and instead they would be recycled. Needing to be recyclable, weather proof, durable and under an 8-ounce weight limit, Martinson said coming up with a material to fit the requirements was tough. “I had to think a little bit about what material to use for the ornaments,” Martinson said. The students have been working for about three weeks and cooperating together to make it happen, Martinson said. “Older students painted some of the trees and mountains, more difficult concepts,” Martinson said. All ages got to help paint decorations on the trees and landscape. Cunningham said she feels very confident that the state will meet its goal of providing 5,000 outdoor ornaments, along with 3,500 indoor ornaments for the 70 smaller indoor trees they are providing. Martinson said he hopes the project will stimulate discussion with families, and hopes they’ll go online to view photos of the tree. Cunningham said an exciting aspect of the project is that one child will be chosen by a random drawing for an all expense paid trip to the Capitol to flip the switch and light the tree alongside the Speaker of the House. “It’s great they’re excited about the project. It’s important considering it’s an election year that they take an interest in government,” Martinson said. Cunningham said the Capitol Christmas tree is different than the National tree that will be at the White House. “The capitol tree is more of a symbol of democracy and the nation’s people. It’s a gift from Colorado to the people of the United States,” Cunningham said.